This is a problem of bones and joints, and affects women slightly more frequently than men. It is more common with increasing age, usually presenting after the age of 45. It is sometimes given different names - arthrosis, osteoarthrosis and degenerative joint disease, for example - but all these mean the same thing. Normal bone ends are covered by cartilage, which helps bones move freely and easily without rubbing against each other. 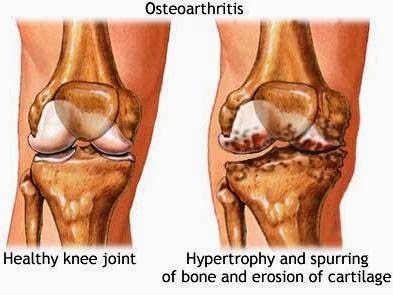 In osteoarthritis (OA), these cartilages thin, and the bone underneath thickens up as a result. This causes inflammation around the bones and joint, causing pain, swelling and problems in movement. Normal daily activities probably have little part to play in the development of OA, but any activity that puts repeated stresses on a particular joint or bone may predispose to OA. Being overweight is undoubtedly a risk factor for knee OA, and previous fractures of a joint or joint surgery will increase its risk of developing OA also. The main symptoms are two-fold; pain and stiffness in a joint. Exercise worsens these and rest makes them better, and cold or damp weather is often said to worsen them too although this is highly specific for each individual. The main joints affected by OA are the hip and knee, with the small joints of the hand and wrist, and neck also being commonly affected. There may be 'clicks' or 'cracks' when these joints are moved, and symptoms worsened by certain postures or activities such as driving or writing. Many cases of OA can be diagnosed from the clinical examination alone, especially of the larger joints. Blood tests can be useful in distinguishing this type of arthritis from rheumatoid arthritis, and X-rays also have a characteristic appearance suggesting OA. Apart from this, there are few other specialized tests available. What Treatment Might I need For Osteoarthritis? At its simplest, treatment may only need to be a daily exercise programme since this increases the mobility of a joint and helps to reduce its pain. Not only does this benefit the joint, it also helps to strengthen the muscles around that joint - vital in supporting and maintaining normal joint function. Simple paracetamol should be the first painkiller of choice, taken regularly and in a dose of up to eight 500mg tablets daily. Non-steroidal anti-inflammatory drugs (NSAIDs) are very helpful in relieving the inflammation around a joint in some people, but should not be used in people with a history of active stomach ulcers or asthma. Surgery in the form of joint replacement is the ultimate treatment for severe OA, with hip and knee replacements being commonplace now. Elbow, finger and shoulder joints have also been replaced, and this type of surgery is developing technically all the time. If replacement is not warranted, the original joint can be left intact but simply reshaped and 'trimmed back' to an appropriate shape - a procedure called an osteotomy. Most people rapidly learn to recognise the pattern of their OA, and what seems to make it worse or better. For many people, their symptoms reach a peak within 4 to 5 years of developing and then get no worse. A combination of exercise, medication and sensible self-help usually means most OA sufferers do not need to have surgery at any time in their life, although hip replacements are the commonest reason for such surgery in patients with OA. A small percentage also need strong painkilling medication, and can face increasing disability if surgery is not an option due to ill-health or severe obesity (another consequence of severely restricted activity because of OA). Yes - eat a sensible diet, and avoid trendy 'arthritis-beating wonder diets' which have no basis in fact. Cod liver oil, and cherries - at least a dozen a day - appear to possibly have some active components that may minimize inflammation, but good nutrition is vital. Some sufferers find simple 'alternative' treatments such as homeopathy, acupuncture and reflexology useful, but this is individual to each person. Daily exercise helps to prevent weight gain and joint stiffness (swimming is an excellent example), and always keep your weight steady if you can - lose it if you are becoming overweight since this merely serves to increase the load on the joints and worsen symptoms. 1. How long have you noticed problems with your joints? 2. Is one particular joint affected worse than any other? 3. Is there one particular symptom you notice more than any other? 4. Are you very stiff when you first wake up? 5. Have you tried any treatments to help yourself already? 1. If my symptoms are sometimes better when I rest, why should I be exercising regularly? 2. Will hormone replacement therapy (HRT) be of any benefit to me? 3. How bad do I have to be before I can have a new joint fitted? 4. Is OA different to 'rheumatics' or rheumatoid arthritis, and why? 5. Am I entitled to any disability benefits?